7 Days Annapurna Base Camp Trek is specially designed for those who wants to have awesome adventure in less time. 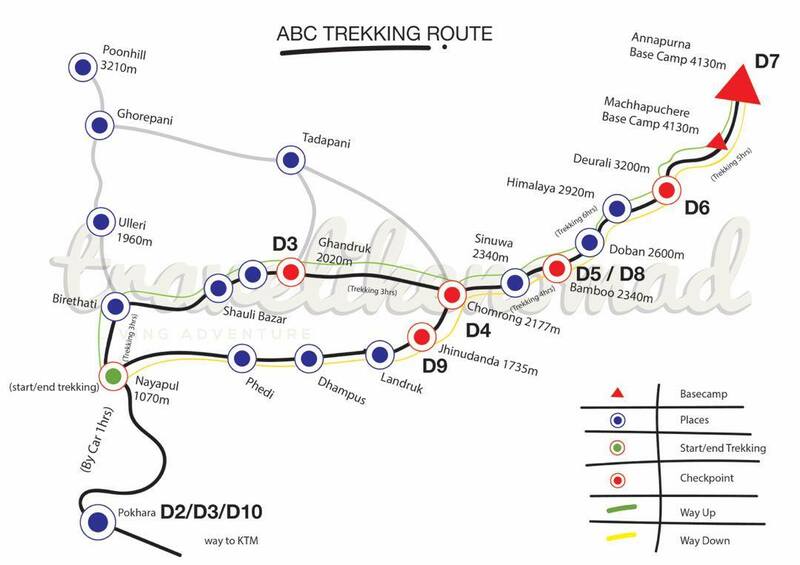 Normally, ABC trek requires the minimum of 10 days. Since we Bharal Adventure have brought you this opportunity just in 7 days. You can observe the mesmerizing view of Annapurna II, Annapurna III, Annapurna IV and so on. Their beauty is indescribable and they draw your attention. The only thing that you can do is to take their photos with your camera. Take photos as much as you like and as far as you can reach to the corners of the base camp. 8 Days Annapurna Base Camp Treks starts from the foothills of Nayapul ridge, some 35 kilometers away from Pokhara. 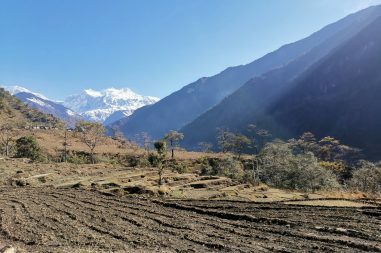 This itinerary takes you right into the heart of the Annapurna Mountains and returns via a small circuit route. It delivers fantastic mountain views on the northward and returning southward leg of the journey. The climax of the trek is the stunning Annapurna Base Camp. Peaks of the western portion of the great peaks surrounds the travelers. 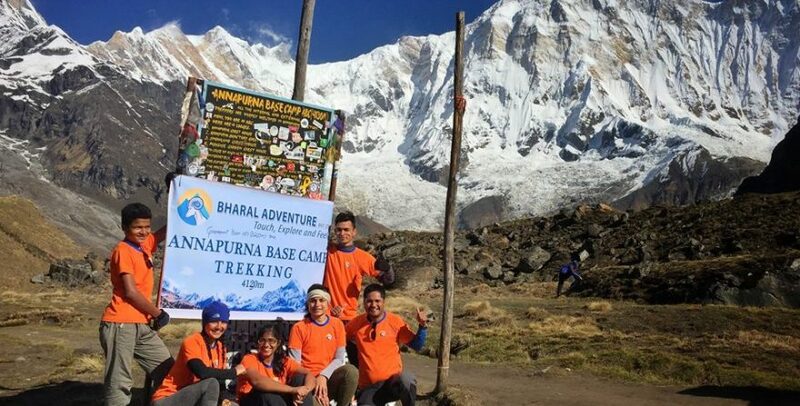 Hence book the diversified and vibrant trekking in Nepal package of 7 days Annapurna Base Camp Trek which is forwarded by the Bharal Adventure Pvt. Ltd. In conclusion, we have the specialized team of the trekking crew for the Annapurna region. We assure you best hospitality and quality services. For this trek, there will be one leader, 1 assistant leader (4 trekkers:1 assistant guide) and Sherpa porters for carrying luggage (2 trekkers:1 porter). This arrangement ensures that should anybody in the group is sick, the trip can still go ahead as planned. Our experience has led us to believe that a maximum of 12 people is an optimum number to fully enjoy a trip. However, if a traveler is interested in larger groups then that can be arranged too. We will be staying at 3 star hotel in Kathmandu, 3 star hotel in Pokhara and tea-houses during the trek. All accommodations are on twin-shared basis.Single supplement will be served on request and will cost an additional USD 250. Although single rooms are readily available in Kathmandu and the trekking regions at lower elevation, it might be difficult to find them at higher elevations. Rock climbing, Ice Climbing and Mountaineering (for expedition leaders). All of Bharal Adventure’s treks are planned with high degree of awareness of AMS (Acute Mountain Sickness). Going up at higher altitude too fast causes a medical condition serious enough to kill. We understand that for a safe trek, it is essential to allow sufficient time for acclimatization. Sensible planning is therefore required to minimize the risk of AMS. Bharal Adventure's itineraries are designed to prevent AMS as much as possible. But, it is important to remember that some visitors are more vulnerable than others. This is moderate trek suitable for passionate walkers with the ability to walk at least 5-7 hours a day with a light day pack. Walking in higher altitudes is more physically demanding than walking in lower altitudes; however, if we are in excellent health with average physical fitness and have a positive attitude, self confidence and strong determination, we can accomplish this trek successfully. Exercising and jogging regularly for some weeks prior to the trip is a good idea to enhance our strength and stability. Past hiking experience would be an asset but no technical skill is required for this trip. Participants with pre-existing medical conditions such as heart, lung, and blood diseases are required to consult their doctor before taking the trip. It is also advised that you inform Bharal Adventure about the medical condition before booking the trek. A representative from Bharal Adventure will pick you up at the airport and take you to the hotel for rest. You will be clarified about the preparations about the journey and if you want, you could also visit our office if you are interested. In the evening, a welcome dinner will be hosted to introduce you to the Nepalese delicacies. Today you will fly to Pokhara by Kathmandu in a plane. This experience would be a thrilling one which would be a memorable part of the Journey. 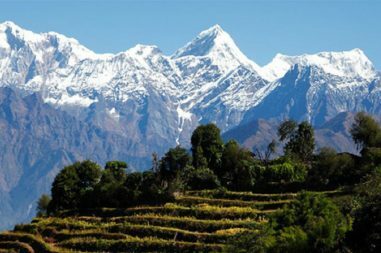 You will be amazed to observe the beautiful himalayan ranges of Nepal. After a short and sweet flight of 20 minutes. Then we will trek to Chomrong for about 7 hours. After descending to the suspension bridge over the Chomrong Khola you will hike the undulating trail to the small hamlet of Dobhan via the villages of Sinuwa, Kuldihar and Bamboo. About half an hour past Dobhan a shrine which is the sacred home of the deity Panchhi Baraha and next to it is a view of an impressive waterfall. Passing the Modi Khola the trail goes steeply up to Himalaya Hotel for your night halt. A pre-dawn wakeup call promises unforgettable views and photo opportunities from the rim of the glacier. A circle of peaks from Hiunchuli, past Annapurna South to the vast ice wall topped by Annapurna I (8,097m/26,566ft) and Khangsar Kang tower above you, round to Gangapurna, Annapurna III, and Machhapuchhare. Below, in its U-shaped valley, the glacier grinds relentlessly. After breakfast, retrace your steps down to Sinuwa for a hot shower and more comfortable night. This day would be quite rushing day. In the morning you will trek for 5 hours to the place Matque which is amazingly beautiful. Then we will have 3 hours drive to Pokhara. After reaching Pokhara we will catch up our quick flight to Kathmandu and overnight in the hotel. 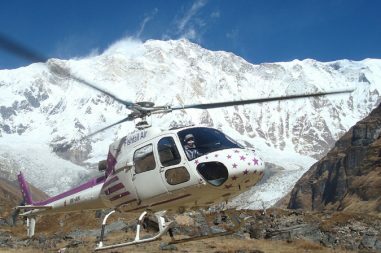 The airport representative from Bharal Adventure will transport you to Kathmandu International Airport around 3 hours before your scheduled flight from where you will depart.